Currently, web sites are integrators of heterogeneous information and services that are oriented to providing content aggregation. From a Model-Driven perspective, web applications need conceptual mechanisms that make it easy to describe, manage and reuse contents and services in order to deal with content aggregation at a higher level of abstraction. 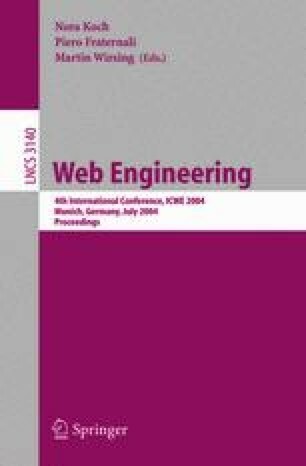 Our work presents conceptual modelling techniques that extend the OOWS navigational modelling by refining the navigational context definition and introducing the concept of information abstraction unit to specify the contents of web applications of this kind. These new abstractions provide powerful reuse mechanisms that produce considerable benefits because both development time and effort can be reduced. Finally, the paper presents some ideas to implement content aggregation taking these enhanced navigational models as input. This work has been partially supported by the MCYT Project with ref. TIC2001- 3530-C02-01 and the Polytechnical University of Valencia, Spain.